Standard lists of links, whether internal or external, are pretty boring, and users hate boring. Here are a couple of ways to polish it up a bit. The first way is to add an icon for each of the links. 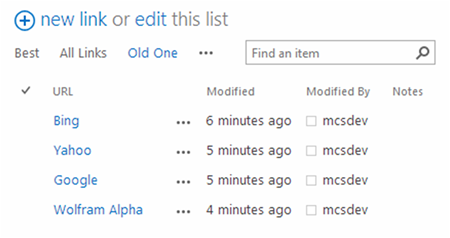 Start by going to List Settings under the List tab. 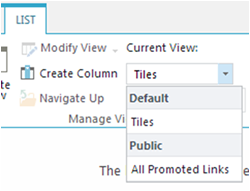 Name the column Icon, choose Hyperlink or Picture for the type, and under Format URL as: choose Picture. Then click OK.
You’ll then need to add some pictures to your site. I usually just place these in site assets. The location doesn’t really matter so long as they don’t move and you can get the URL. Click Site Contents in the Quick Launch menu on the left. Click on the Site Assets App. Drag and drop your Pictures into that library. Click on the Ellipsis (…) next to your picture and copy the URL. Once you have the URL, you can add that picture to your link list. Your picture will appear. You may want to edit your picture to be the right size for the page. Most users are familiar with promoted links from their experience rolling out a new site. The home pages of new sites, by default, have a list of promoted links for adding content. It’s pretty easy to create your own list of promoted links. Click on Site Contents and choose add an app. Click on Promoted Links, give it a name, and click OK.
Find your new Promoted Links App and click on it. Your list will, of course, be blank. Adding links requires looking at the app in a different view, so first, click on List and choose All Promoted Links. You can then add links one at a time or with the Edit this list option. This option has a nice animation, but it does take up a lot of space.